Tommy Parasi (aka "Tommy 2 Scoops"), owner of The Brightside Tavern led the parade and Riza Hunger, Events Chairperson of the HPHA coordinated the event. There were many terrific local business participating including the new luxury dog day care, The Executive Dog Lounge and Canine Canine which sponsored pumpkin decorating. Donations collected benefited the Paulus Hook Park Fund and the Liberty Humane Society. 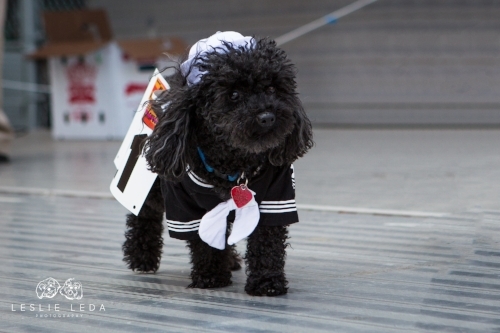 The pet parade was followed by a children's costume parade. Now for a preview of the photos from the parade! Little Bo Peep stole the stage and won the best costume award! There were pirates and ladybugs and peacocks OH MY! And the winner's circle included many great costumes! These pets have the best parents a dog could ask for! Photos by Leslie Leda Photography LLC. Copyright 2016.